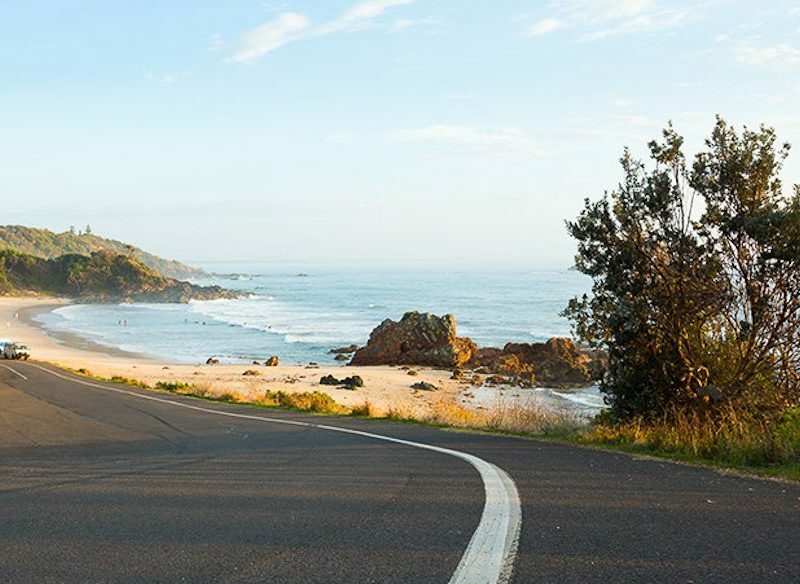 On Port Macquarie's coastal food trail (photo: Daniel Hine). 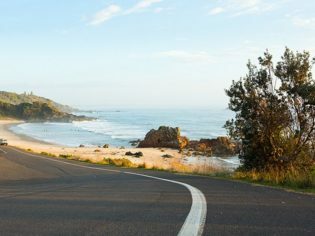 Often overlooked by road-trippers making a beeline for Brisbane or Sydney, Port Macquarie has more than enough reasons to lure gourmands away from the hum of the highway. Sample the best on offer with this two-day food-lover’s itinerary. Port Macquarie has a certain air of modesty about it. It feels like an outpost, like you’re in a flashback to an earlier episode about living on the coast in Australia. Initially conceived as Australia’s third largest penal settlement, the town is liberated by a chain of beautiful beaches, stunning hinterland, waterfalls and views. It’s that ruggedly handsome landscape that has seen a wave of entrepreneurs, sea-changers, artisans, brewers, vintners, baristas and farmers stay smitten with the place, reshaping the identity of the town one vineyard, bar, farm cafe, restaurant, food truck and brewery at a time. Pick your own, Ricardoes Tomatoes, Port Macquarie. You say tomato, I say Ricardoes. Or, more specifically, Ricardoes Tomatoes. Just over a decade ago, Ricardoes Tomatoes consisted of one little green honesty box rusted onto a roadside stall piled high with plump red tomatoes. Fast-forward and what exists today is far from a tin-pot operation: the award-winning tourist attraction run by brothers Anthony and Richard Sarks now has 30,000 strawberry plants, and more than 1 million tomatoes are handpicked each year. “Eleven years ago, I was managing a tea tree farm up north and I put a two-line ad in the local paper to advertise my surplus home-grown tomatoes. I just wanted a bit of extra beer money, a bit of drinking silver, that’s all. What I found was that once the word got out, people were willing to drive from as far as Kempsey and Taree simply to get a bag of tomatoes and we thought, ‘We might be onto something here’,” says Anthony. On any given day, visitors to the farm can be found plucking their own tomatoes and strawberries in the polytunnels, stocking up on jams and chutneys or choosing ingredient-driven dishes from the Cafe Red menu. Ricardoes’s intensely flavoured fruit took out the Best Tomatoes gong at the 2014 Royal Easter Show for the fifth time in a row and Anthony’s free farm tour and tasting allows the produce to do the talking. Next stop is Bago Vineyards and Bago Maze, near Wauchope, which is surrounded by a tall eucalypt forest that caters to the East Coast’s largest koala population. The vineyard – one of five in the region – has a tenacious grip on the hillside, its healthy appearance belying the prodigal effort it takes to actually grow grapes in this region. A-maze-ing, Bago Vineyard, near Wauchope. “If you can grow grapes here, you can grow grapes anywhere. The humidity is the biggest challenge and as a result my wines are light and fresh, low in alcohol and 100 per cent indicative of the area,” says owner Jim Mobbs, who was born and bred in Port Macquarie and has been working the farm for 40 years. The 60-year-old is a second-generation farmer who planted a crop of chardonnay in 1985 and produced his first vintage in 1987. Bago is very much a family affair. Jim’s 91-year-old father Jim (‘Pop’) still works the land, his landscape architect son, Ian, 32, designed the maze, his designer daughter, Kellie, 30, dreamt up the label for the bottles, and son Steven, 28, works as a winemaker. Enjoy a glass of verdelho and a cheese platter while immersed in this idyllic scene, where children bounce happily around the maze’s pruned pathways, boardwalks and bridges in the gardens, which have been outfitted for a wedding. On the way back into town, quell your coffee cravings at The Living Room, a retro riot of polished concrete, low-lying lounges and crochet cushions housed in an old petrol station in Wauchope. With its weekly green market, cafe and yoga studio, the space is a haven for the local community and a home away from home for pierced, tattooed, dreadlocked and purple-haired people. Back in Port, The Grape & Petal also pumps up the boho vibe: it features Art Deco fixtures, kitsch object d’art and a load of bulls’ horns. It’s equal parts cafe, bar and restaurant, and is one of the best places in town to taste the Pacific Coast’s most seductive offerings of food and wine. Oh, and the coffee is incredible. Having access to Hastings River’s vegetable basket and fruit bowl hasn’t hurt the Grape & Petal, says manager Nick Diaz who recommends the salad of roast asparagus, bocconcini, cherry tomatoes, Spanish onion and rocket, and the twice-cooked pork belly with green apple purée, candied balsamic glaze and a fresh apple and parsley garnish. Chef Lindsey Schwab’s travels around the world have also informed the frequently changing menu at Fusion 7. As did his stint with the father of fusion cuisine Peter Gordon, says the keen surfer, who returned to his hometown nine years ago to be close to family. Dinner is divine: deep-fried, soft-shelled crab with green papaya salad, peanuts, Thai basil and tamarind is just one of many dishes inspired by Lindsey’s travels. Soft shell crab, Fusion7, Port Macquarie. Port itself is a compact town to walk around. After a leisurely breakfast at The Corner, and killer coffee at Crema Espresso, it’s on to lunch at The Stunned Mullet. Located at the ‘Paris’ end of Port Macquarie, the town’s only hatted restaurant looks out over the arc of sea and sand that is Town Beach. Start here to explore the flavours of the region with rockstar chefs David Henry and Mitchell Brumfield. Their prowess is demonstrated with offerings such as parsnip purée with eggplant chutney, compressed apple and labneh, pappadum and watercress or Mandagery Creek venison marinated in black vinegar and white miso and served with taro crisp, beetroot relish, radish and marinated apple, charred to finish. Chef Joe Soliman at The Corner restaurant, Port Macquarie. After a post-prandial stroll, it’s onto the Black Duck Brewery for a cold one, where we meet Alistair and Kate Owen who have also realised the potential appeal of the city. Situated in the middle of a scattering of buildings in the town’s industrial estate is where you will find this boutique brewery. Being part of the town’s emerging scene is really exciting, says Alistair, a former civil engineer who relocated to the region in 2006 for a road project and never left. He poured his first pint in October 2012 and says he has been committed to safeguarding the quality of the craft operation ever since. His Phoenix Migration Stout won gold at the 2014 Sydney Royal Beer & Cider Show and the Irish Red took bronze in 2013. “The quality of our beers was good and now they are just getting better. We have 13 different varieties, which are all hugely popular and we try to keep the operation as local as possible,” says Alistair, who produces Summer Swallow, Beach House Blonde and Sunday Pils. RocKwiz geeks will appreciate the fact that the Sunday Pils mentioned in Grinspoon’s album Thrills Kills + Sunday Pils is a nod to the beer favoured by the band’s frontman and local Phil Jamieson, who can often be found enjoying a Sunday session at the brewery. A Sunday here includes live music, with brewing equipment forming the backdrop and a pop-up food truck doling out beef kebabs and hot dogs. There are certainly worse ways to wind up a weekend in the town that the CSIRO says has the best climate in Australia. Much, much more to eat and drink?